On Aug. 21, the Moon will cast its shadow down on Earth, giving all of North America the chance to see a solar eclipse. Within the narrow, 60- to 70-mile-wide band stretching from Oregon to South Carolina called the path of totality, the Moon will completely block out the Sun’s face; elsewhere in North America, the Moon will cover only a part of the star, leaving a crescent-shaped Sun visible in the sky. Find eclipse times for your location with our interactive version of this map. A total solar eclipse happens somewhere on Earth about once every 18 months. But because Earth’s surface is mostly ocean, most eclipses are visible over land for only a short time, if at all. The Aug. 21 total solar eclipse is different – its path stretches over land for nearly 90 minutes, giving scientists an unprecedented opportunity to make scientific measurements from the ground. No matter where you are, it is never safe to look directly at the partially eclipsed or uneclipsed Sun. Make sure you’re prepared to watch safely, whether that’s with solar viewing glasses, a homemade pinhole projector, or online with us atnasa.gov/eclipselive. 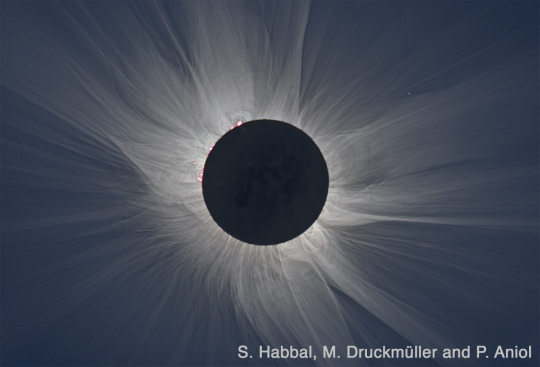 Within the path of totality, the Moon will completely obscure the Sun’s face for up to 2 minutes and 40 seconds, depending on location. This will give people within the path of totality a glimpse of the innermost reaches of the Sun’s corona, the outer region of the atmosphere that is thought to house the processes that kick-start much of the space weather that can influence Earth, as well as heating the whole corona to extraordinarily high temperatures. In fact, scientists got their first hint at these unusually high temperatures during the total solar eclipse of 1869, when instruments detected unexpected light emission. It was later discovered that this emission happens when iron is stripped of its electrons at extremely high temperatures. This region of the Sun’s atmosphere can’t be measured at any other time, as human-made instruments that create artificial eclipses must block out much of the Sun’s atmosphere – as well as its bright face – in order to produce clear images. We’re funding six science investigations to study the Sun’s processes on Aug. 21. Teams will spread out across the path of totality, focusing their instruments on the Sun’s atmosphere. One team will use a pair of retro-fitted WB-57F jetsto chase the Moon’s shadow across the eastern US, extending the time of totality to more than 7 minutes combined, up from the 2 minutes and 40 seconds possible on the ground. Our scientists are also using the Aug. 21 eclipse as a natural science experiment to study how Earth’s atmosphere reacts to the sudden loss of solar radiation within the Moon’s shadow. One region of interest is Earth’s ionosphere. 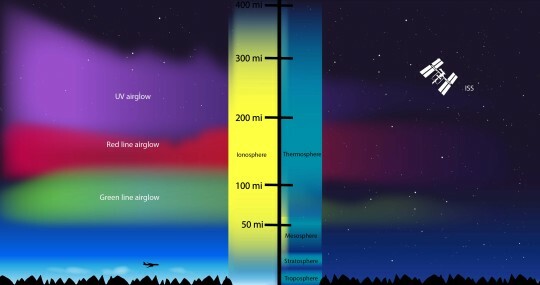 Stretching from roughly 50 to 400 miles above Earth’s surface, the tenuous ionosphere is an electrified layer of the atmosphere that reacts to changes from both Earth below and space above and can interfere with communication and navigation signals. The ionosphere is created by ionizing radiation from the Sun. When totality hits on Aug. 21, we’ll know exactly how much solar radiation is blocked, the area of land it’s blocked over and for how long. Combined with measurements of the ionosphere during the eclipse, we’ll have information on both the solar input and corresponding ionosphere response, enabling us to study the mechanisms underlying ionospheric changes better than ever before. The eclipse is also a chance for us to study Earth’s energy system, which is in a constant dance to maintain a balance between incoming radiation from the Sun and outgoing radiation from Earth to space, called the energy budget. Like a giant cloud, the Moon during the 2017 total solar eclipse will cast a large shadow across a swath of the United States. Our scientists already know the dimensions and light-blocking properties of the Moon, and will use ground and space instruments to learn how this large shadow affects the amount of sunlight reaching Earth’s surface, especially around the edges of the shadow. This will help develop new calculations that improve our estimates of the amount of solar energy reaching the ground, and our understanding of one of the key players in regulating Earth’s energy system — clouds. Learn all about the Aug. 21 eclipse at eclipse2017.nasa.gov, and follow@NASASun on Twitter and NASA Sun Science on Facebook for more. Watch the eclipse through the eyes of NASA at nasa.gov/eclipselive starting at 12 PM ET on Aug. 21.